Since 'Some like it hot ...' this is an extra hot authentic Mexican hot sauce. Salsa Picante. Contains about 142 1 tsp servings of extra hot sauce. 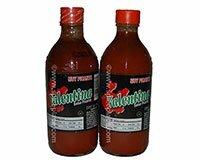 Valentina Hot Sauce is a product of Mexico. Ingredients: Water, Chili Peppers, Vinegar, Salt, Spices, Sodium Benzote (As A Preservative).